I know. I know. You all had just about given up on me ever posting again. Well me too but for some reason I feel re-energized enough today to give it a shot. Since my last post things have been a frenzy. We found a dream home, put our house on the market, had a few big custom orders in the etsy shop and did the holidays in between all that. We are hoping that this weekend we will finally get an offer on our home. We have two families coming for 2nd showings so keep your fingers crossed for us. Once we are under contract I'll show you pictures of the new house. Meanwhile we were forced to finish up all our unfinished projects around here so I have some pictures of those to share. 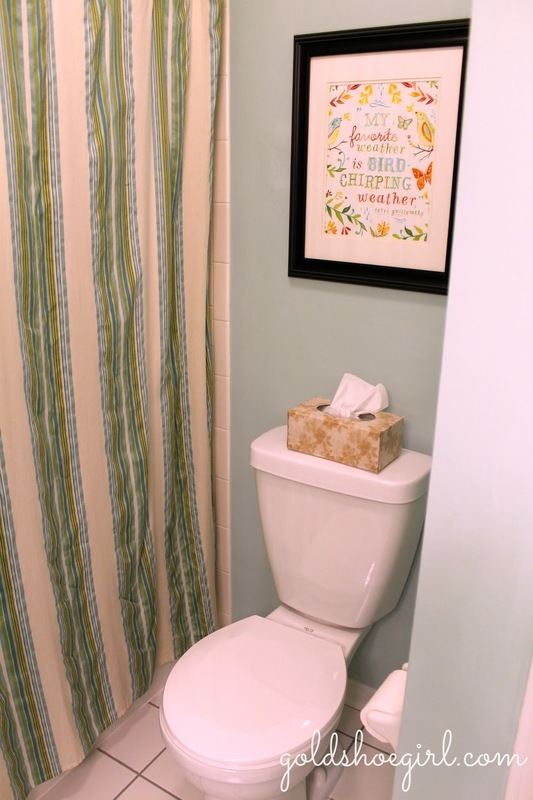 First up is the upstairs hall bathroom otherwise known as the kids bathroom. Old builder grade oak cabinet, dingy white walls, skimpy drawer hardware, etc. I think the worst thing was that it had white walls, white countertop, white toilet, white tile in the shower and white tile on the floor. Way too much white with the only contrast being the old 1980's oak cabinet and trim. Here's a picture taken in the middle of making our improvements. You can see more in this post. 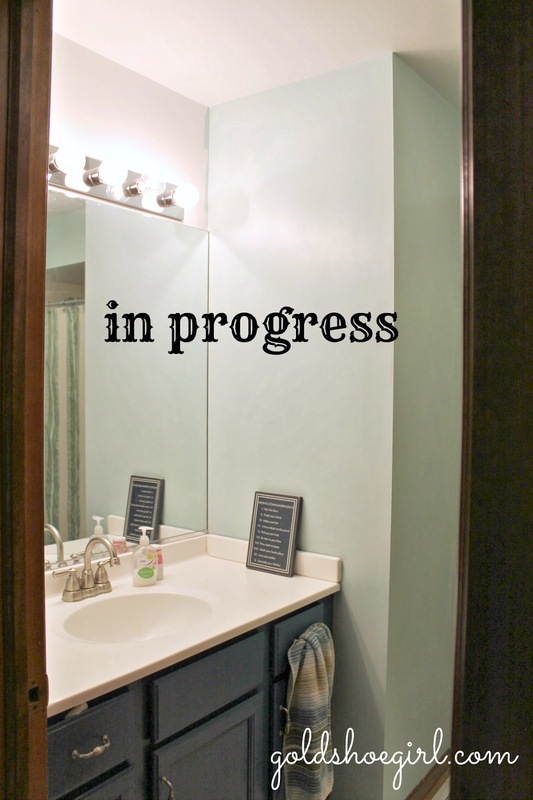 You can see that we framed out the mirror with some fancy molding and replaced the light fixture. We also updated all the door knobs and hinges to a satin nickel finish. On this side we replaced the toilet - which was not originally planned for but it started smelling all the time - totally gross - like old urine smell - like gas station bathroom gross. I think it was because it was 20 years old and a cheap builder toilet. When we lifted out the old one the wax ring was almost gone and there was crystallized pee all underneath it - super gross. Now it is sweet smelling - for a toilet - and it flushes awesomely if you know what I mean:). 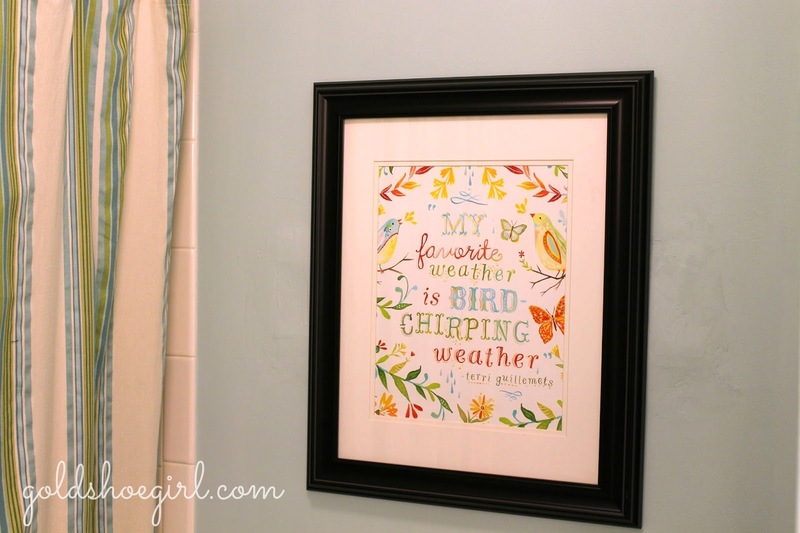 This Katie Daisy print hangs on the wall above the toilet and is one of my favorite new things in the bathroom. It just adds a nice color and a cheerful sentiment. 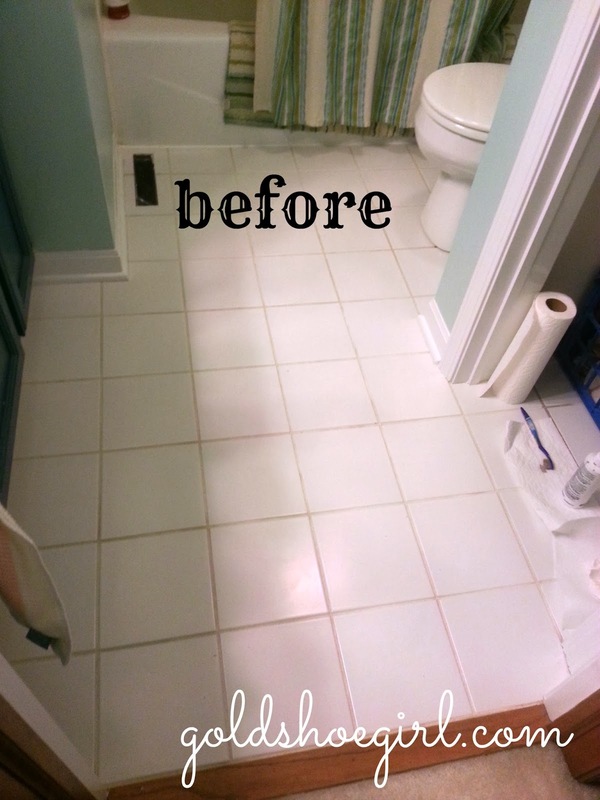 One of the most dramatic changes in the bathroom for the least amount of money was fixing the grout on the floor. In the past couple of years, I had tried every method possible to get this grout clean and nothing worked. It was just stained, discolored, and yucky. I had seen a similar improvement project on the yellow cape cod blog and thought it might work here. I started it one afternoon and many tedious hours later it was done. It was so worth it. It made the floor look like new!!! I was and am super pleased with the results. 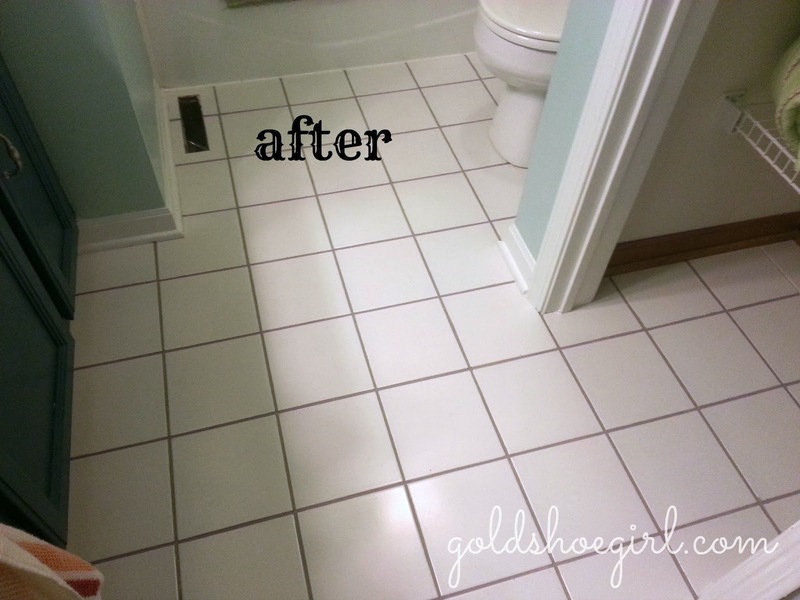 The floor has some nice depth and interest now and helps break up all the white surfaces still left in the bathroom. I bought the product at Home Depot for about $10 and applied it with a toothbrush at first but then I switched to q-tips. I used a darker gray shade but it comes in a dozen different choices. This was completed a few months ago and has shown no wear or tear. Really a great bang for the buck project! 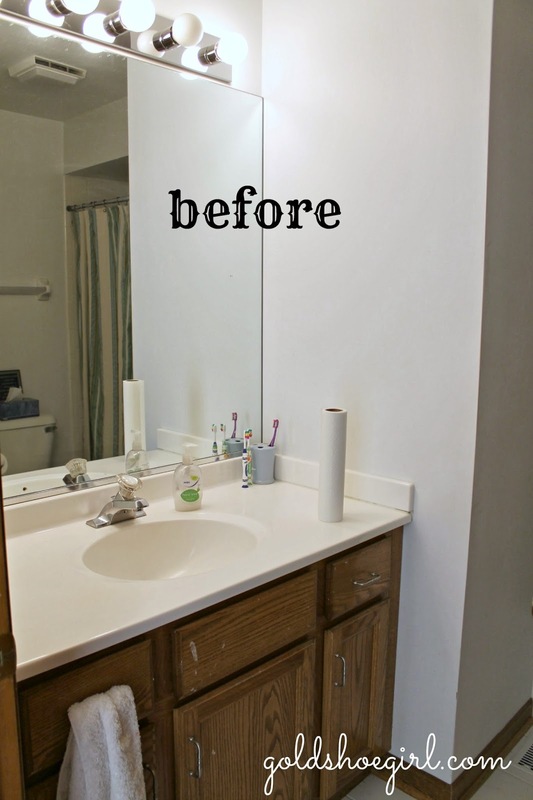 So in this small space we painted the walls, the vanity, the doors, and the trim. 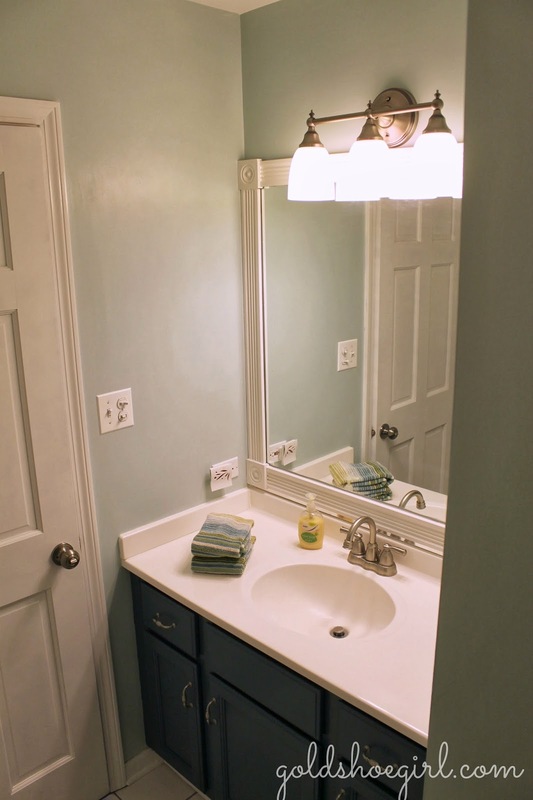 We also upgraded the drawer pulls, replaced the light fixture, added molding to the mirror, replaced the door knobs and hinges, replaced the toilet and painted the tile grout. It was a lot of sweat equity and our costs came in just under $500. Not too bad. That's the scoop on that bathroom. Kind of a shame we will be moving now that it is so cute. Oh well. Seems that as soon as I update a few spaces in our house we always decide to move. Anyone else have that happen to them? The ol' fix it up but don't really get to enjoy it syndrome.